My personal supply of sour, sweet and bitter. All delicious! 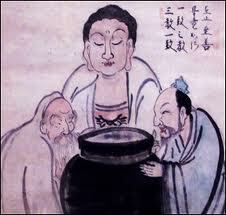 In the picture “The Vinegar Tasters”, Confucius, Buddha and Lau Tzu stand around a pot and taste vinegar. Confucius tastes sourness as he perceives the world is out of order, therefore the world is sour. The Buddha tastes bitterness, as he sees only people with too much desire, so they drive themselves to a bitter life. Lau Tzu says, “The vinegar is perfect as it is. This is how it tastes, heaven is on earth, too many rules spoil it, you can’t change the taste of vinegar with a rule, this is its nature, we should not force the way, nature has her way and she follows Tao, if you understand the flow, you understand the world.” Accepting the infinite variety in life is a lovely philosophy, I think. 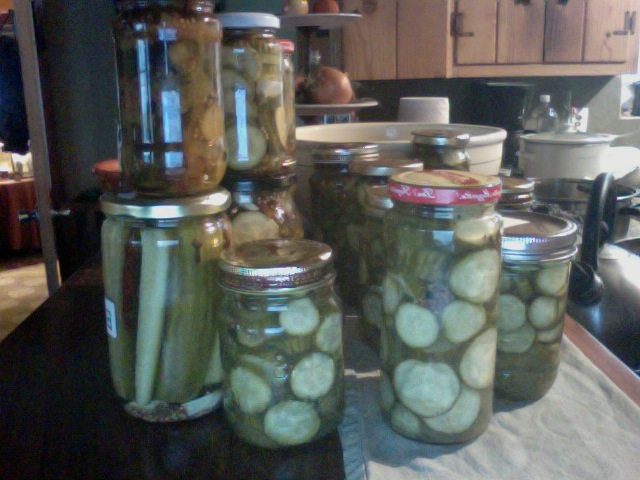 And so, as you probably guessed, I make pickles. Lots of them, different kinds, all family recipes. It works for me as a food, and as a metaphor, here’s how I make that work. My day started with me consciously letting go of some useless anger at an ex. He is as he is, and trying to make him understand our daughter’s real needs would be like asking a plant to edit my books. What’s the point? So, like so many parents who put their kids first, I take a deep breath and continue the repairs. On the way home from my school run, a friend called me in a hysterical depression about her daughter’s traumatic boyfriend breakup. This friend was micromanaging her teen’s life without realizing that her reaction had nothing to do with the daughter, the pain and fear she was experiencing were completely from and about herself, so I ‘talked her down off the ledge.’ Then I went for a walk in the rain, and stopped frequently to feel the moisture and the breeze brush like feathers across my face. So there you go, Bitter, Sour, Sweet!! And it’s all good. Really. Some things just are, and the best I can hope for is to step in and repair the damage done. Some things I can fix, so I do. And some things I can make wonderful, just for me. Ah, motherhood, friendship, and self. So, in celebration of this magnificent conundrum that we call daily life, I’m offering the logical solution. Recipes for pickles. I know, I know, it’s obvious, but still. Try one. Then taste it, close your eyes and roll the flavor around in your mouth. Is it sweet? Sour? Bitter? All of them at once? The moral of the story is, the conclusion and your reaction are not inherent, they are what you choose to make it. So enjoy it all, if you can. Know that when the bitter comes, it too will pass. When something good in your life sours, step back and look at why—is it really the situation, someone else’s ‘fault,’ or is it your own pre-determined opinion that is making you feel badly? And if your day is sweet and you find beauty in simple things, even painful things, then most likely you have accepted events as they are and are not fighting against the world as it is. Congratulations, you are human and using your free will. So here are two recipes, one sour, one sweet. If you like bitter, and many people do, add a teaspoon or two of citric acid for the tang that thrills. 3 1/2 lbs small pickling cucumbers. fresh dill, garlic cloves, and small dried red peppers. Rinse the cucumbers, cut off ends and slice as desired. I like to quarter them lengthwise. In a large nonreactive pot combine water, vinegar, sugar and salt. Bring to a boil. In clean sterile jars (I collect jars all year, remove the labels, and then run them through the dishwasher on hot.) pack the cucumber slices, garlic (halved), small bunch of dill, and one or two peppers, leaving about a 1/2 inch of space at the top. Fill the jars with the boiling vinegar mixture, wipe the top and seal. Put the jars into a large, lidded pot with water about halfway up. Bring the water to a boil and then time for 10 minutes. The jars should be slightly raised on the top when you take them out. (Carefully!) Make sure the lid is on as tight as possible, then place on a kitchen towel to cool. As they do, you will hear an occasional ‘schlup’ sound. That means you did it right! The jar is sealing. When they are cool, label them and place in a cool spot to cure. Refrigeration is not necessary. Wait at least one week, but they will last for months, and get better!! Leora’s Pickles. Sweet and tart. Take an 8 qt. basket of small cucumbers. Scrub them well and put them in a crock whole. Sprinkle 2/3 cup pickling salt over then cover with boiling water and let stand overnight. To make the syrup, Boil 3 parts vinegar to 1 part water, (probably about four or five cups of vinegar, but it depends on your jars and your pickle packing ability!) 1 tablespoon of ginger, 1 tablespoon of alum, (this is available at most grocery stores and is what makes pickles crisp) 1/2 cup pickling spice and 3 pounds of sugar. Yes, 3 pounds of sugar. Bring it to a boil. Meanwhile, drain your your brined cucumbers, cut into the size slices you want and pack in clean jars. Pour the boiling syrup over, and follow the procedure above. Wait at least three weeks for these, and then, yummy!! So that’s my Taoist take on life, when you feel bitter, know that it’s one of the flavors in life, everybody gets some. When things are sour, try to enjoy the process of understanding why. When a moment is sweet, be truly grateful. And no matter what, if you make some pickles, you will find yourself with lots of eager friends to share them with you. Previous postHow to Survive a Casting Session. Next postA Legacy of Love. Thank you for sharing! My mouth is watering! I grew up on a farm and my grandmother used to make pickles from cucumbers. Delish!